A pair of stories appeared on Theme Park Insider recently about pricing for Universal Studios Hollywood and Shanghai Disneyland. Though they are unrelated, they signal a shifting tide in theme park admission pricing. I would be very surprised if dynamic pricing does not arrive at the Disneyland Resort within a year. The price offers differ slightly between the mentioned parks. Universal Studios is maintaining a constant gate admission price while offering a discount for online orders. Shanghai Disneyland is instead splitting ticket prices across the board for peak and non-peak days. The effect is basically the same, though you have to make a greater effort to take advantage of the Universal prices. Two data points are not a trend. However with circumstances as they are at Disneyland, this seems like the exact solution Disney Parks will be looking toward in the future. On one hand, ratcheting up Annual Passport prices hasn't really lessened crowds at the park. That may slacken over time as some passholders allow their passes to expire. But attendance pressures are only going to increase when Star Wars Land finally opens. Adjusting annual passport prices can't be sufficient to prevent overcrowding. On the other hand, the one day ticket for Disneyland is now $99.00. Crossing that threshold and making the price to visit the Happiest Place on Earth at least a hundred dollars will have huge psychological repercussions for visitors. Even now, as a middle aged man, I balk any time a price climbs into the triple digits. I suspect that I am not alone. The obvious solution for Disneyland to meet these disparate needs is to institute dynamic pricing. The park can raise prices on peak days and leave off peak days at the current price. That would allow the park to say that they still have a sub-hundred dollar ticket while also encouraging attendance on lower traffic days. Blockout days for lower tier annual passports already serve that function. It's time that daily tickets offer the park the same tools. From my point of view, this is an inevitability. When they decide to do so is anyone's guess. But if Michael Colglazier happens to be reading this, drop me a line. I'd be happy to put a proposal together for you. UPDATE 02/27/2016: I would say "Called it" if it hadn't been so blatantly obvious. Laughing Place and various Disneyland bloggers are reporting that seasonal pricing is starting at Disneyland this weekend. Pricing signs on the ticket booths have already been replaced with monitors, a necessary step to adjust prices from day to day. Good thing we have annual passes. Oh, those expire in April? Damn. UPDATE 2 02/27/2016: It's official. UPDATE 3 02/29/2016: As long as I'm making updates to this thing, I might as well mention that it is not really dynamic pricing. It's not even seasonal pricing as Disney would have it unless we're talking the weekend and holiday season versus the early week season. It's really just tiered pricing. Any other name actually implies too much. So I was only mostly right. As has been long expected, construction have gone up all over Disneyland. Between removal of holiday overlays, refurbishments, and the start of Star Wars Land, it feels as though it would be easier to count the attractions that are still open rather than name all those that are closed. From the photographs MintCrocodile posted recently, it would be hard to find a sight line that doesn't include a construction wall or barrier. As the work goes on beyond the walls, Disney Parks have given us some indication of what the new Rivers of America will look like. Based on the posted concept art, it looks amazing. As much as I enjoy riding the train around Disneyland, there is far too much staring at foliage or the backside of buildings. Riding over a trestle along the northern end of the rivers will likely become the highlight of the loop. Theme park bon vivant Matthew Golluta pointed out one particular poster which recently went up on the construction walls across the Big Thunder Trail. Along with other Frontierland posters, the Disney Parks crew also hung a Nature's Wonderland poster. It took me a bit to realize that this was not just a reproduction but an update, replacing "Via The Mine Train Thru Rainbow Caverns" with "Via The Disneyland Railroad" and removing the location labels. Could this be a hint that Imagineering has more in store for the railroad than they have let on. We can only hope. 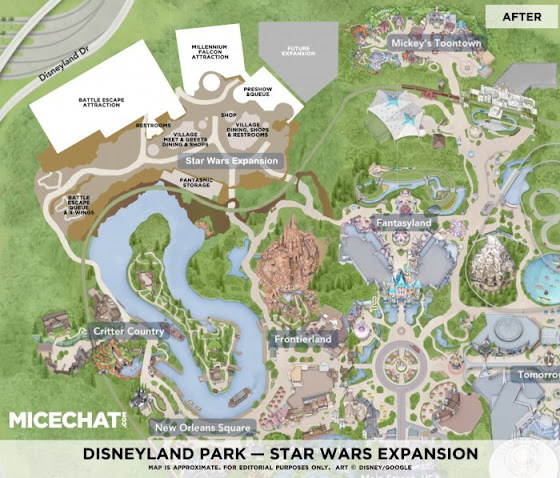 Finally, along with its usual histrionics, MiceAge recently reported on the proposed layout for Star Wars Land. On the face of it, it looks exactly like what I would expect. Whether this map is the real thing or an educated guess, it remains to be seen. But, I would not be surprised if Star Wars Land looks a lot like this. It will be interesting to watch construction unfold over the coming years. It is an exciting time to be a fan of Disneyland.